Our customer “Wayne in Connecticut” has sent us a few excellent questions about olive oil production. We’re happy to share them with you. Q. Is olive oil pressed from just the green unripened olives, the black ripened ones, or both? If both, there must be a distinct general difference between the taste of “green olive oil” and ripened olives. The highest quality olive oils are pressed when the green olives just begin to change color. This yields an oil full of flavor and possessing the best attributes. As olives continue to develop and ripen, they yield more oil, but that oil possesses a higher acidity level. It is very expensive to produce a high quality oil. There are some productions that yield only a liter or two per tree. If you are mixing an oil having a very low acidity, with an oil with a significantly higher acidity level, you will end up with an “average” oil. Oils pressed from riper olives also seem to degrade or lose their characteristics at a faster clip. Q. I notice in your descriptions of the oils, their flavor is usually a reference to a particular taste… say “green grass”, some fruit, peppery, etc. Is this a product of aging the olive oil with flavorings or just the natural flavor of the individual brand of olives grown? I assume olive oil is aged–maybe it isn’t?— just pressed & bottled instead? The grassy, fruity, peppery characteristics are due primarily to the olive cultivars. The oils from Sicily (predominantly Nocellara, Biancollila, and Cerasuola cultivars) tend to be grassy, and the cultivars are different from the more pungent oils from Tuscany (predominantly Frantoio and Leccino). For top quality extra virgin olive oils those lovely distinctions are directly due to the cultivars grown and the skill of the grower. The Novello oil (first of the season) is freshly bottled by those producers who believe in selling new oil. Not all believe this is the right thing to do! By tradition, some producers prefer to let their oil settle or decant for a few weeks before bottling. Those producers store oil in stainless steel tanks with great care to preserve the freshness. Aging is not a good thing. In part 1 of the Olive Oil Buyer’s Guide, we took a look at the anatomy of a great label on a bottle of extra virgin olive oil. For a refresher, take a look the detailed and revealing look at Primo DOP from Frantoi Cutrera in Sicily. In this update, we’ll take a look at the symbols of Organic Certification. And, let’s talk terminology: Biologica is the Italian term for Organic. On labels, this is sometimes shortened to Bio. There has long been significant cooperation on Organic standards between the U.S. and the European Union (EU). 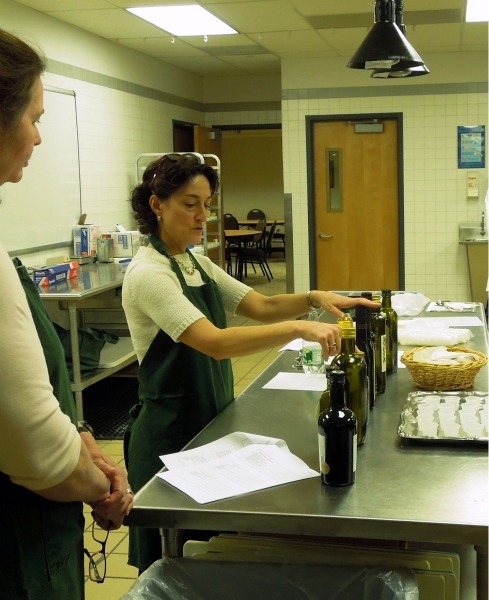 For years, agencies in Europe have been certified to meet US Department of Agriculture standards, and the olive oils imported to the US were able to use the USDA Organic seal on their labels. We’re now at the cusp of a transition in labeling and a new agreement features a freshly designed symbol for EU Organic products. As a result of the trade agreement, both the EU Organic seal and the USDA Organic seal may be used. For products imported to the US, either seal represents that the product meets the organic standards in the US. We’ve already noticed early arrivals of Italian Extra Virgin Olive Oil carrying this attractive new leaf symbol. Organic certification can be costly and some smaller olive oil producers will continue to elect to grow their olives organically, without adding the costs of certification. Within the product descriptions at Olio2go, those are noted as “organically produced”. 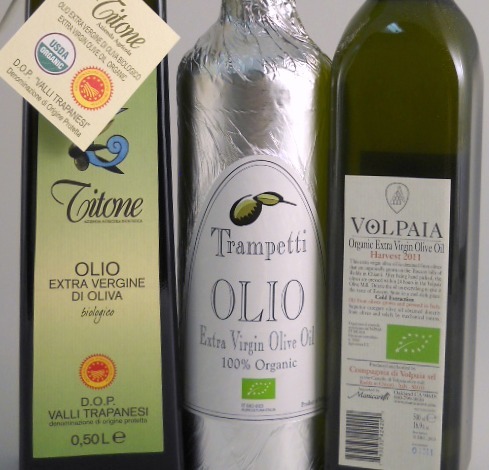 While we have many biologica/organic olive oils on our web site at OLIO2GO, we think that the labels on Titone, Trampetti, and Volpaia do a great job of illustrating the application of the seals. Titone’s neck label clearly shows the DOP and USDA Organic symbols, Trampetti carries the leaf on the front label, while Volpaia’s label includes the EU leaf on the back of the bottle. So often at Olio2go, we’re asked pressing questions about olive oil. We have a FAQ and you can read it here. These are the Quick Notes. The earlier the olives are harvested, the less oil they yield. That early oil tends to have peppery characteristics from the “verge of ripeness” of the olives. 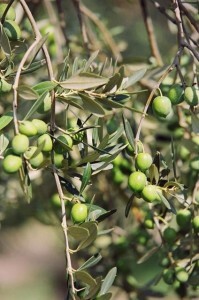 Early harvested olives yield lower acidity levels than later harvested olives. The early harvested oils also hold the highest levels of the beneficial polyphenols — and associated health benefits. 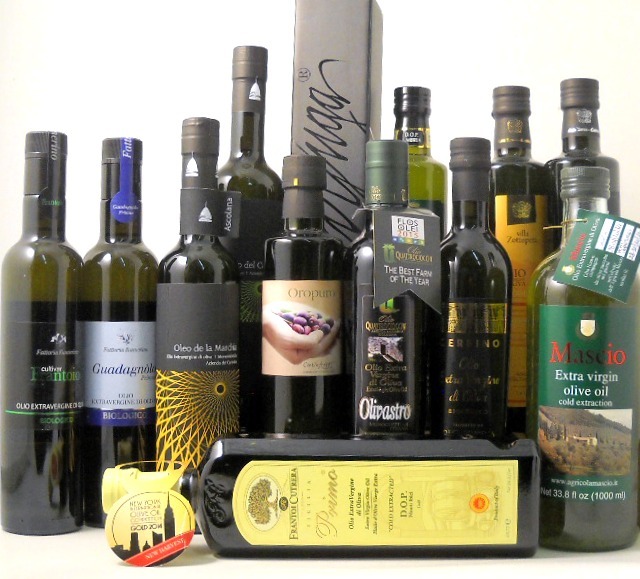 The early harvest, early bottled, quick shipped olive oils are bottled as Novello oils. We’re planning to carry a half dozen this year. It’s likely that we’ll have three “brands” by early December. 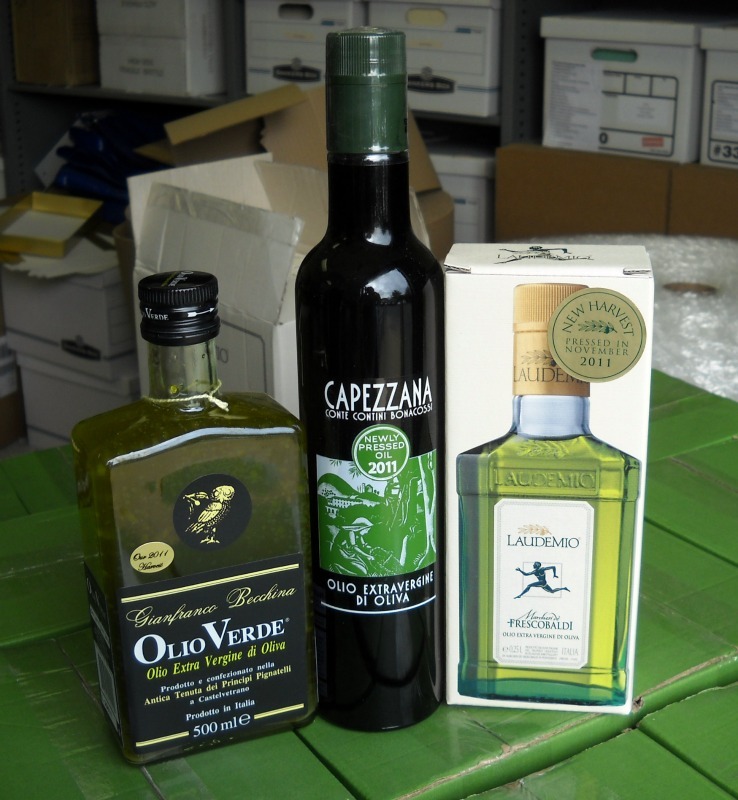 Those will be Olio Verde Novello, Tenuta di Capezzana Olio Nuovo, and Canonica Verde Novello. Last year, we had early shipments of Marfuga L’affiorante, Santisi Novello, and Olio Beato Organic New Harvest. The links here relate to the current products. The novellos will be listed on our web site as they become available. Crossing borders, I like to think of the Novello oils as wine fans think of Beaujolais. It’s the first of the season and definitely worth celebrating. We’re eagerly awaiting news of the harvest. 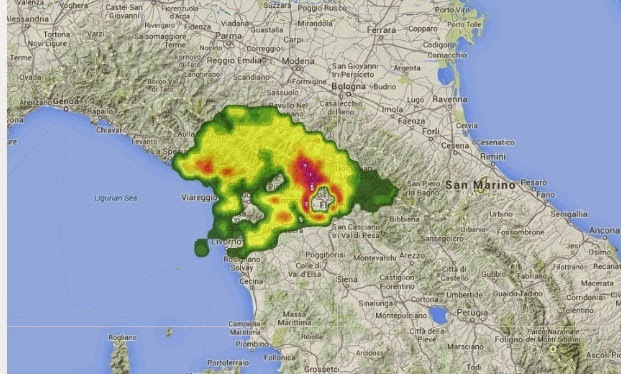 Azienda del Carmine (home of the famed Olio del Carmine and Ascolana) has shared that they are planning to begin the harvest around 15 October. They have even invited our customers to visit the estate to share in the harvest. From Liguria to Sicily, the harvest will take place between October and January, based on the micro-climates of each hillside. Frost is an enemy to the process so those in the coldest microclimates will begin the harvests first, to ensure the crop is harvested before it is “too late”. And what does cold pressed mean? In Italian, the phrase “spremitura a freddo” means cold pressed. Through the pressing process, the temperature is monitored to make sure that it does not increase (friction causes heat…) as an increase in temperature can affect the acidity level of the oil. Every Italian extra virgin olive oil is cold pressed. And, with that, other work is pressing in!